As a result of our cities’ light pollution it is often not so easy to identify constellations in the night sky. From the city, stargazers often only see the very luminous stars, the brightest of which is Sirius, while only Venus and Jupiter are capable of matching its light. In our area in Europe, Sirius is never especially high above the horizon. For example, at 50° north Sirius can be seen at only 23° above the horizon. If you look to the south during the next few evenings, you will see the bright Sirius in Canis Major. As orientation you can start at Orion, since the stars of his belt, Alnitak, Alnilam and Mintaka, direct you on the path to Sirius (See the above image, which was created by the software, Kosmos Himmelsjahr 2016 Professional). Sirius is definitely not to be missed! It emits a blue-white light and its low position in relation to the horizon, combined with its brightness, causes it to twinkle wildly. As a result, the unwitting could mistake the star for a blinking aircraft or possibly a UFO. 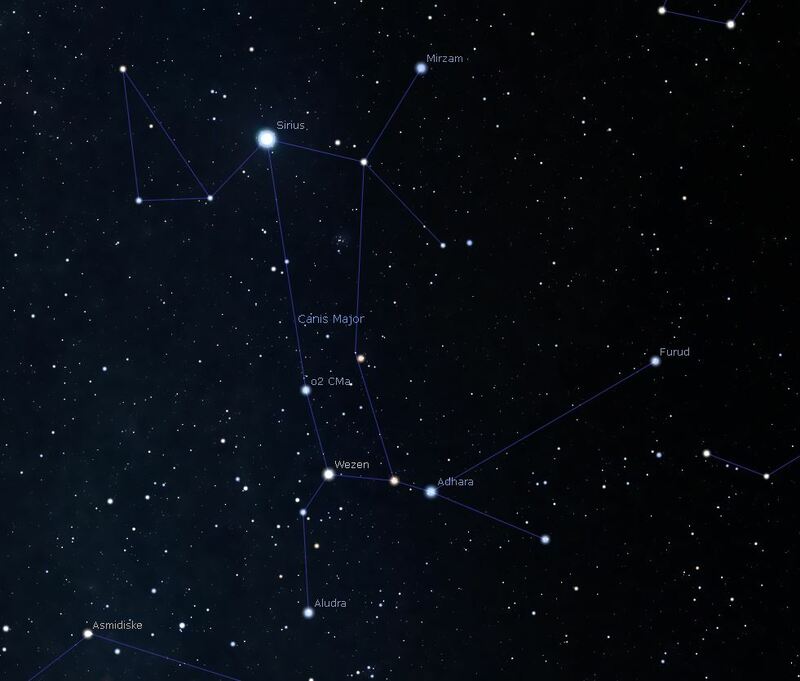 Because of its position in Canis Major, Sirius is also known as the ‘dog star’. At the time of the ancient Greeks, sirius could only be seen early in the morning sky, when the hottest days lied ahead, consequently resulting in the expression dog days. Sirius is a star 8.6 light years away. For us human beings that is quite far, but in astronomical terms the star would be considered our cosmic neighbor. After Toliman (Alpha Centauri), Sirius is the closest star outside of our solar system, which you can see with the naked eye. Since Toliman is an object of the southern hemisphere, Sirius has become our nearest neighbor for those in the northern hemisphere. Its magnitude is not just a result of Sirius’ proximity, but also of its high temperature of 9,400 Kelvin. Our Sun for example is a far cooler 5,800 Kelvin and as a result ‘yellower’ as compared to Sirius. Much like our Sun, Sirius’ energy source is made up largely of hydrogen and the fusion process to helium. Since Sirius is more than double the Sun’s size however, this process occurs at a much higher rate, resulting in a brightness 23 times that of our own star. In the year 1718, the English astronomer Edmond Halley noticed that Sirius changes its position in the sky. It moves slowly between other stars. Such movements are not unusual for stars, and of course our relatively short lifespans makes us believe that the sky is unchanging. Close examinations by Friedrich Wilhelm Bessel showed that this slow movement was indeed a wavy-lined shape. Something must have been pulling and tearing at Sirius. Only in 1862 was the American Alvan Clark able to prove that Sirius was not alone. 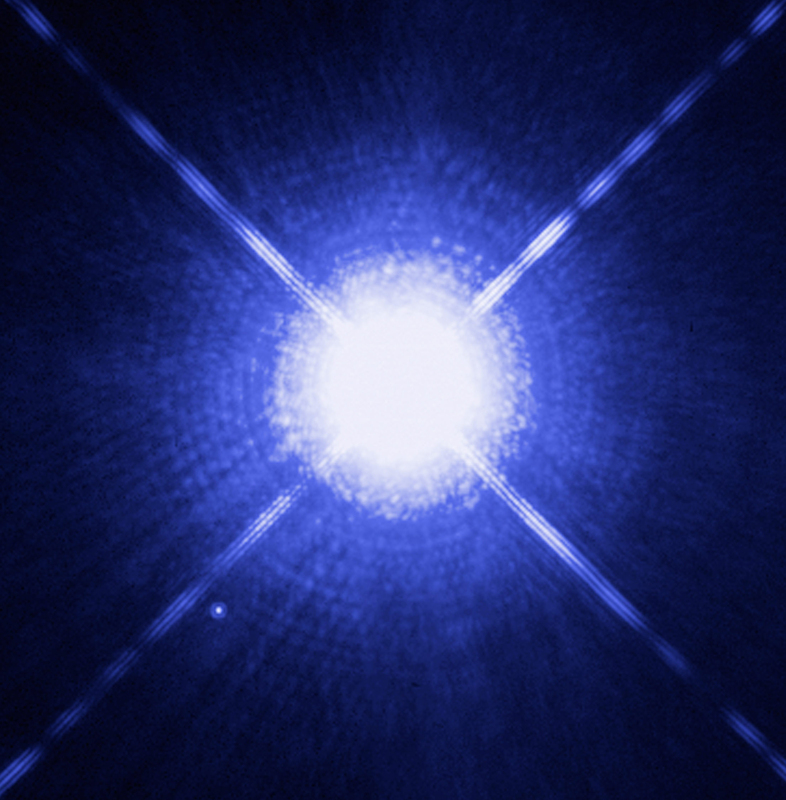 The image below shows a photo take by the Hubble Space Telescope of Sirius and Sirius B. As you can see, there isn’t much to see. Sirius B is the little point below on the left. Viewing it requires an excellent precision, since the two objects are so close to one another, while simultaneously having differing magnitudes. Such binary stars are not all that rare. The little Sirius B doesn’t really fit into astronomer’s scheme of things, however. Judging from its magnitude and the movement of Sirius A, scientists were able to determine that Sirius B had about the same mass as our Sun while only being a bit smaller than Earth. The density of Sirius B is so high, that a a cubic centimeter of its make-up would have a mass of four metric tons! The so-called white dwarf has a highly dense core of a dying star, which also features a searing temperature of 25,000 Kelvin!